November 25, 2018 10:24 am. Almond Eye wins the 2018 Japan Cup. The Japan Cup, in its 38th year, continues to attract some of the top turf horses from around the world—67 runners from North America, 144 from Europe, 26 from Oceania and five from Asia—while a number of runners have made this race their starting point towards further international success in following years. Cheval Grand captured his first G1 victory in last year’s Japan Cup, beating Tokyo Yushun (Japanese Derby, G1, 2,400m) winner Rey de Oro (JPN, C4, by King Kameameha) and defending champion Kitasan Black (JPN, by Black Tide), who were second and third, respectively. This year, Cheval Grand returned with hopes of defending his title and claim his second G1 win while Rey de Oro headed for the Arima Kinen instead after registering a third in the Kyoto Kinen (G2, 2,200m) in February, a fourth in the Dubai Sheema Classic (G1, 2,410m) and back-to-back wins in the autumn All Comers (G2, 2,200m) and the Tenno Sho (Autumn) (G1, 2,000m; Oct.28). Kitasan Black concluded his racing career with his Arima Kinen (G1, 2,500m; Dec.23) triumph last season. 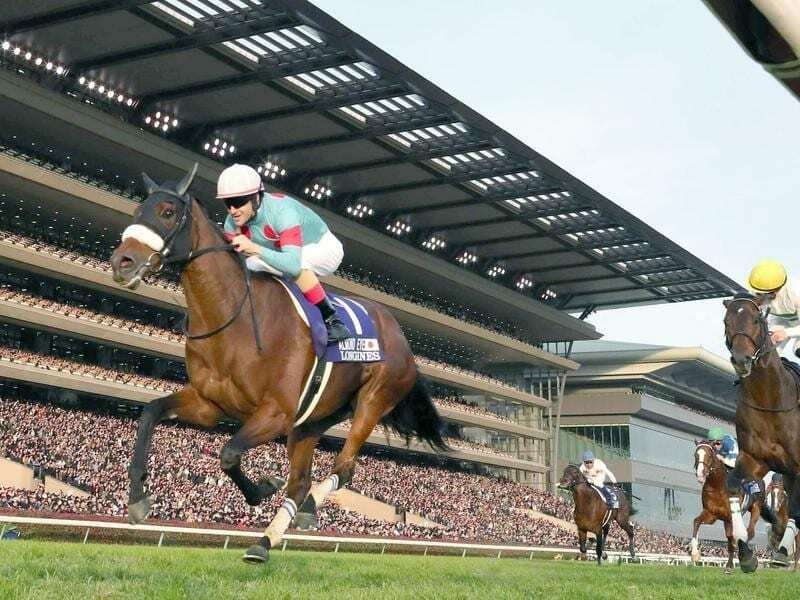 This year’s Japan Cup welcomed two foreign contenders from Europe. Capri, from Ireland claimed the Irish Derby (G1, 2,400m) and the St. Leger (G1, 2,900m) last year and came off a fourth in the Champions Stakes (G1, 1,990m; Oct.20). Thundering Blue from Great Britain and an uprising runner who claimed the York Stakes (G2, 2,050m) in July and the Stockholm Cup International (G3, 2,400m) in September, came off a runner-up effort in the Canadian International (G1, 2,400m; Oct.13). Six out of 12 of the Japanese contenders taking on the foreign raiders were Grade 1 winners; Almond Eye, this year’s filly triple crown champion who became the fifth since Gentildonna (JPN, by Deep Impact) in 2012 to make the sweep is coming off her Shuka Sho (G1, 2,000m; Oct.14) victory. Two-time G1 winner and 2016 Best Three-Year-Old Colt Satono Diamond and Cheval Grand were first and fourth in their previous start in the Kyoto Daishoten (G2, 2,400m; Oct.8). Last year’s Kikuka Sho (Japanese St. Leger, G1, 3,000m) winner Kiseki and race favorite and winner of the Osaka Hai (G1, 2,000m) Suave Richard finished third and 10th, respectively, in the Tenno Sho (Autumn). 2016 Hong Kong Vase (G1, 2,400m) and 2017 Takarazuka Kinen victor Satono Crown came off a 12th in his bid to defend his Takarazuka Kinen title in June. Others included 2016 Japan Cup runner-up Sounds of Earth who came off a ninth in the Mainichi Okan (G2, 1,800m; Oct.7) while Win Tenderness, winner of the Meguro Kinen (G2, 2,500m), Ganko, victor of the Nikkei Sho (G2, 2,500m) and Noble Mars, third in the Takarazuka Kinen (G1, 2,200m), came into the race after finishing fourth, sixth and ninth, respectively, in the Copa Republica Argentina (G2, 2,500m; Nov.4). 2017 St. Lite Kinen (G2, 2,200m) champion Mikki Swallow and NAR (National Association of Racing; local public racing) Hokkaido-based Happy Grin were also among the line-up.